Classically Liberal: Thriving on dissent? Or demanding consensus? As is widely known now, someone hacked into the computers at the Climate Research Unit of the University of East Anglia. There is a major concentration of global warming gurus at East Anglia, in the UK, so this is somewhat more significant than it sounds. Whoever did the hacking didn’t fool around with data, what they did was copy and disseminated a large quantity of documents and emails that they found. The so-far anonymous hacker did it because he thought the information was important for public appraisal of the warming scare. Openness of records, of course, is applauded by most people unless it makes them appear questionable, or contradicts their agenda. And the warming gurus are none too happy that their information is open to the public—especially since they have often gone to great lengths to hide their data from scrutiny, something that I always find sufficient to raise an eyebrow, and more than just a few questions. A general description of the emails, from the Wall Street Journal is interesting. So I will take the luxury of quoting it at length, concentrating on what I think is of interest. And I will make a few comments along the way. The publicly posted material includes years of correspondence among leading climate researchers, most of whom participate in the preparation of climate-change reports for the Intergovernmental Panel on Climate Change, the authoritative summaries of global climate science that influence policy makers around the world. Okay, so we know these are some of the top gurus of the global warming movement. A partial review of the emails shows that in many cases, climate scientists revealed that their own research wasn't always conclusive. In others, they discussed ways to paper over differences among themselves in order to present a "unified" view on climate change. On at least one occasion, climate scientists were asked to "beef up" conclusions about climate change and extreme weather events because environmental officials in one country were planning a "big public splash." If this is accurate I think it shows a highly politicized organization as opposed to a purely scientific one. That they differ with one another is science. Progress in science is made because people differ. Some great leaps in science are precisely due to one individual challenging the consensus of the day. But discussions on how “to paper over differences among themselves in order to present a ‘unified’ view” sounds rather political to me. If the goal is truth one does not hide differences of opinion but thrashes them out with open debate and discussion. I can see why a “unified” view is expedient to a political movement but not to science. His complaint was that the awareness of danger from alleged climate change “will not emerge from a normal scientific process of truth seeking” so “post-normal” science is needed instead. That kind of science, he says, will allow warming adherents to “trade (normal) truth for influence.” Trading truth for influence sounds to me, like trading science for politics. Certainly warming evangelist Al Gore has said the same thing. He claimed it was “appropriate to have an over-representation of factual presentation of how dangerous it [global warming] is” in order to get the audience to his film to accept his claims. But then he is a politician and lying to scare the public is common in political circles. But is this science? Or is it politics? Hulme says that what science produces is “provisional knowledge” that “can be modified through its interaction with society.” It is changed when “it rubs up against society.” Do the theories change? Do facts vary? Or does he mean that in a social setting politics now becomes important and we should use politics to “adjust” science to political agendas? When it comes to global warming theory, Hulme says “the stakes are high, uncertainties large and decisions urgent,” so this new kind of science has to focus on “who has the ear of policy,” in other words, who sets the political agenda. Old, traditional science is deficient because “it assumes science can first find truth, then speak truth to power” but that is deficient because it ignores “values, perspectives and political preferences. This requires that “we have to take science off centre stage” in order to concentrate on political preferences. American global warming archbishop, Stephen Schneider, in a 1989 Discover magazine interview, makes it quite clear that he is pushing a political agenda. He said that politicized scientists needed to “capture the public’s imagination.” And that, “of course, entails getting loads of media coverage. So we have to offer up scary scenarios, make simplified, dramatic statements, and make little mention of any doubts we have. This ‘double ethical bind’ we frequently find ourselves in cannot be solved by any formula. Each of us has to decide what the right balance is between being effective and being honest. I hope that means being both.” Schneider seems to be saying, yet again, that there is conflict or "double ethical bind" between his science and political agenda. Projection is something we all do. It is the act of taking something of ourselves and placing it outside of us, onto others; sometimes we project positive and sometimes negative aspects of ourselves. Sometimes we project things we don't want to acknowledge about ourselves, and so we turn it around and put it on others (i.e., "It's not that I made a stupid mistake, it's that you are critical of everything I do!"). Sometimes it is simply our experiences (i.e., "My father was a reasonable man when we disagreed, so if I use reason with my boss we can work out our disagreement"). In several of the emails, climate researchers discussed how to arrange for favorable reviewers for papers they planned to publish in scientific journals. At the same time, climate researchers at times appeared to pressure scientific journals not to publish research by other scientists whose findings they disagreed with. Again the politicization of science by warming scaremongers is obvious. Assuming an accurate portrayal of their emails this means that they were intentionally trying to skew the debate in one direction. This was done in two ways. One was to make sure that their own papers got published. The other was to use their influence to prevent contrary studies from seeing the light of day. If science is the pursuit of truth, if truth is a claim consistent with reality, then vigorous, open debate is required. In politics an agenda dominates and it makes sense as a political tactic, to suppress dissent. The warming advocates are acting precisely like a political, or even religious movement, not like scientists. More recent exchanges centered on requests by independent climate researchers for access to data used by British scientists for some of their papers. The hacked folder is labeled "FOIA," a reference to the Freedom of Information Act requests made by other scientists for access to raw data used to reach conclusions about global temperatures. Many of the email exchanges discussed ways to decline such requests for information, on the grounds that the data was confidential or was intellectual property. In other email exchanges related to the FOIA requests, some U.K. researchers asked foreign scientists to delete all emails related to their work for the upcoming IPCC summary. In others, they discussed boycotting scientific journals that require them to make their data public. We are asked to accept global warming theory on the basis of computer models making projections based on data sets. Of course, as with all such models, “garbage in, garbage out,” so the data that is input is critical to appraise the claims being made by the modelers. Yet, the gurus of warming are absolutely paranoid that other researchers will be able to scrutinize their data and methodology. I will say that this is not “political” behavior, not at all. This is precisely how religious sects, protecting sacred dogma behave. Throughout history the religions of the world have strictly forbidden “heretics” from questioning the theology of the sect. Investigation, that didn’t conform to the “consensus” was punished, often with death. Religious thinking is directly contrary to scientific thinking. Religion, and politics to a lesser degree, fears dissent, schismatics, heretics, and so forth. Science thrives on dissent. Based on the descriptions of the private discussions of the warming advocates, they act more like the College of Cardinals meeting in the Vatican, then they act like scientists grappling to discover the truth. 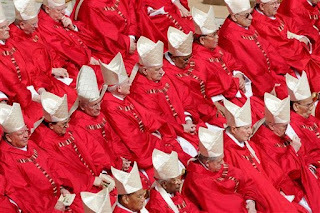 Photo: The College of Cardinals, that's consensus. posted by blog owner at 11/22/2009 01:50:00 AM DiggIt! Reddit Del.icio.us Slashdot It!